* The lecture will be delivered in Greek or in English, depending on the audience. The purpose of this lecture - recital is to present the Armenian culture seen within solo piano music written throughout the 20th century. It is during this period that Armenian music is for the first time regarded as an “expression of an international culture heading on two directions”: deriving inspiration from Armenian traditional music or using avant-garde techniques. Through his endless walks in the villages and nature of Armenia and through his creative life, Komitas laid a foundation to the formation of the Armenian national music school, which united centuries of old folk musical experience and professional music studies thus, making him the most influential figure in the history of Armenian music. Thus, Komitas ‘walks’ in the music of his contemporaries, leaving his footprints as a resource and as an inspiration for all. This is how I see Armenian piano music, through the simplicity of Komitas, the romanticism and lyricism of Baghdassarian, the energy and the rhythmic drive of A. Arutiounian, the thematic versatility of E. Arutiounian, the harmonic and rhythmic variety of Aristakessian and the patriotism and drama of Khatchaturian. It is I, the reflection of my soul, the different aspects of myself, the mirroring of my feelings; my walk into the beauty and uniqueness of the music of my homeland. In the beginning of the twentieth century the Armenian composer Komitas collected and transcribed the traditional music he heard in the villages, organizing for the first time an official Armenian music repertoire. Through his music the true Armenian spirit is reflected in the work of his contemporaries. Composing in the idiom of a folk instrument, expanding the melody in a monodic character, approaching the music in an ecclesiastical notion are all aspects of the Armenian-ness in music which are clearly evidenced in the work of composers during the socialist-realist era and beyond. Within a cultural context, Komitas was inspired by the nature of Armenia and the traditional practices and rituals through the use of symbolism which added to the growth of a strong sense of national identity. I hope that the music you hear is an opportunity for you to realize how the genius of these national composers capture the pulse of the Armenian people. And all becomes more valuable if we consider that music which is deeply national is at the same time fundamentally authentic and profoundly human. Christine Tokatlian is a concert pianist praised for her academic distinctions and passionate performance. In 2008 she was awarded the honorary "Eleni Myconiou" prize for artistic excellence by the Athens Academy. At the age of six Christine was already taking piano lessons at the National Conservatory of Greece which led to a Soloist’s diploma with a grade of Excellence by unanimous vote and First Prize, under the supervision of Manolis Kokalis. Studying under renowned pianists including Dimitris Toufexis, Yu Chun Yee and Bernard Roberts, between 1996 and 1999, Christine receives her Bachelor of Arts in Music from Deree College, and post-graduate diplomas in Advanced Piano Performance from the Royal College of Music in London (PGDip, PGAdvDip). Performing around Greece, the United Kingdom, Italy, Lebanon, Germany and Armenia alongside distinguished artists including the Komitas Quartet, Christine’s recitals include works by classical, romantic and contemporary composers, as well as new-experimental music all performed with her distinct temperament, undeniably fueled by her Armenian descent. And with the same passionate spirit she premiered Khatchaturian’s Piano Concerto with the Thessaloniki State Orchestra in the Thessaloniki Concert Hall in 2010. 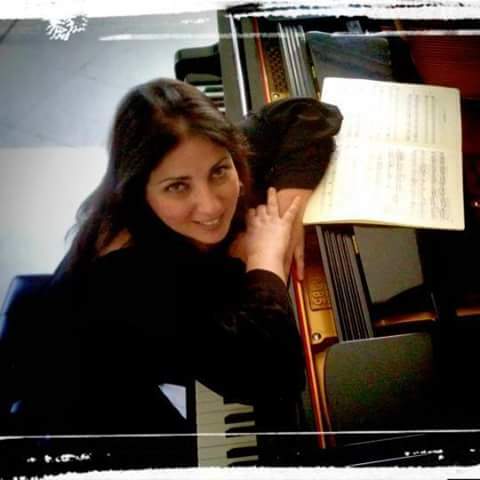 Christine also communicates her talent through teaching as she is currently a professor of music at DEREE - The American College of Greece and a piano professor at the Meandrio Conservatory. As an MPhil/PhD candidate in performance at Goldsmiths – University of London she has extended her research in contemporary Armenian piano music presenting her academic work in conferences in Istanbul and London. "Armenian Piano Images", Christine’s first personal recording with works of contemporary Armenian composers, some of which are world premieres, serves as a window for her audience to see into her dream of magical musical performance. — Christine Tokatlian’s bright future is brilliantly marked by her virtues and her artistic vocation. Her radiant interpretation is defined by her impassionate expression, her strict commitment and respect to the score, her thorough care for the detail in performance and her complete dedication and love for the art of music. These qualities are evident due to her natural gift, on the one hand, and to her youthful musical momentum, on the other. We are still expecting more to hear from her either within her live performances or through her recordings. Listening to the ‘Armenian Piano Images’ her audience can become aware of her tremendous advancement through her bursting technique and most of all through her academic maturity.